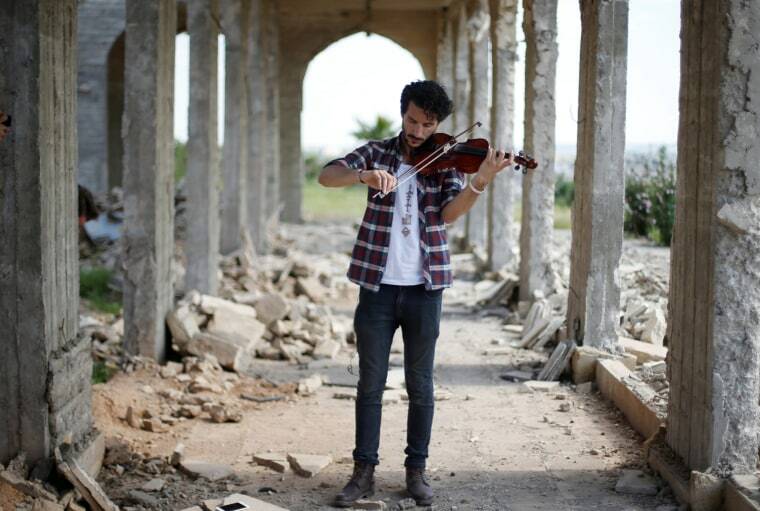 MOSUL, Iraq — Amid the bombed-out ruins of an ancient site revered by both Muslims and Christians in Mosul, Iraqi violinist Ameen Mukdad on Wednesday held a small concert in the city he was forced to flee by ISIS militants. As Mukdad played scores he had composed in secret while living under the militants' austere rule, explosions and gunfire could be heard from Mosul's western districts where U.S.-backed forces are still battling ISIS for control. "This is a place for all, not just one sect. Daesh represents no religion but is an ideology that suppresses freedom," Mukdad told Reuters, using a derogatory name for the militants. "Everything about Daesh is wrong." Mukdad, 28, fled Mosul after ISIS fighters stormed his house and confiscated his instruments, deeming his music a violation of their hardline interpretation of Sunni Islam. Wednesday's hour-long concert marked his first return to the city that was overrun by ISIS in 2014. Mukdad said he chose the Tomb of Jonas, or Mosque of the Prophet Younis, as the site is known by Muslims, to symbolize unity. "I want to take the opportunity to send a message to the world and send a strike against terrorism and all ideologies which restrict freedom that music is a beautiful thing," he said. "Everyone who opposes music is ugly." Mukdad advertised the concert venue and time on social media, a bold move in eastern Mosul at a time the militants still control the Old City across the Tigris river. Soldiers guarding the venue, which lies near the ancient Nineveh ruins, at first refused access after the boom of a nearby rocket rang out, saying they could not guarantee the public's safety. They later relented, and troops joined the applauding crowd. "The performance was like a dream," said Tahany Saleh, who as a woman was forced by the militants to cease her university studies. "I wanted to come to give a message that war has not stopped life in Mosul," she said. "You can see all this damage but still we still want to be happy, we want to listen music." Under ISIS rule, entertainment was banned. But in defiance of the militants, Mukdad continued to play at home alone or quietly with a dwindling circle of fellow musicians, closing windows to avoid detection. "I stopped playing because I was too afraid but Ameen kept going," said Hakam Anas, one of his friends who founded a musical club with the violinist. "We tried persuading him that he could get easily killed, but he kept playing." One night the militants raided Mukdad's house, taking his instruments and vowing to punish him. He escaped to Baghdad where he still lives. In a sign of how nervous Mosul residents remain six months into the military operation to flush out Islamic State, just 20 people, mostly young men, attended the concert. "This is what we young people need," said Abdullah Thaier.